Although the day wasn’t particularly over scheduled, the impending dinner hour was stressing me out. With rescheduled hockey pictures falling in town to the west and meal delivery at the same time in fields to the east, I a lot time mulling over different scenarios that didn’t require me to split in two. Luckily a last minute change in plans with the harvest crew gave me the opportunity to hand off meals to go. These clam shell containers are perfect for field meals. Tuck in pre-wrapped silverware and a napkin. Include a water bottle. Viola, field meals to go. Preheat oven to 325 degrees. In an ovenproof Dutch oven, heat 2 Tbsp. oil over medium-high heat. Brown beef in batches; remove. Add remaining oil to pan. Add onions; cook and stir 2-3 minutes or until tender. Add garlic; cook 1 minute. Add broth and wine; stirring to remove browned bits from pan. Stir in thyme. Worcestershire sauce, salt and pepper. Return beef to pan; bring to boil. Bake, covered 1 1/4 hours. In a bowl, mix the cornstarch and water until smooth; gradually stir into stew. Add potatoes and vegetables. Bake, covered 45-60 minutes or until beef and vegetables are tender. If desired, strain cooking juices; skim fat. Return juices to Dutch oven. Peel, core and cut each apple into eight wedges. Cut each wedge crosswise in half; place in a large saucepan. Add sugar, water, lemon juice and extract. Bring to a boil. Reduce heat; simmer, covered, 15-20 minutes or until mixture reaches desired consistency, stirring occasionally. Wackie Cake (from my mom. Best made from scratch chocolate recipe! Easy & moist!) I have shared this recipe three times now on this blog. LOVE it! Simple and delish! Combine the ingredients above in a large mixing bowl. Make three holes. In one put 2/3 c. salad oil, in the second put 2 tsp. vanilla, and in the third put 2 tsp. vinegar. Pour 2 c. water over all and mix until smooth. Back at 350 for 30 minutes in a greased and floured 9 x 13 pan. Top with chocolate frosting. 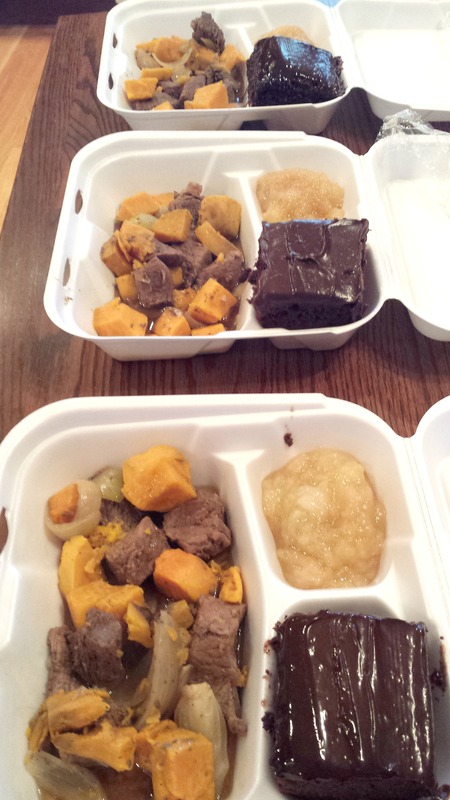 This entry was posted in Farm & Food and tagged applesauce, chocolate cake, field meals, harvest dinner, stew. Bookmark the permalink.